Next time your business gears up for a Re-Org, consider putting the REAL boss at the top –- Your Customers. Unless things have changed since I was a manager at the Support Center, the Org. Chart above is 180 degrees out of whack. Partners are in the big box and customers the smaller one, as Brand is built from the inside out and when Partners come first, all customers benefit from superior service. Honestly, I struggle with this one John. I think it's the ambiguity of the message. Like the old adage, the customer is always right. I prefer, the customer is never wrong. There's always some truth in what their saying, they just may not be communicating that truth effectively. Back to the org chart. Does this mean that customers are treated better than employees? Does this mean their listened to over employees? Does this mean their trusted over employees? I don't have an answer, but I don't mind talking about it either. All this simple org chart means to me is that every employee's boss is really the end customer. Does that make the customer always right? Nope. Just like your boss is not always right. However, just like with your boss ... you should try to satisfy customer's wants and needs in order to best do your job. What I find really interesting with this org chart fipperoo is that every organizational chart I've seen never includes the customer. What if we did include the customer in the organizational chart somewhere? After all ... companies are organized to serve customers otherwise the wouldn't be in business. Including the customer in the organizational chart is an interesting concept. As a process guy, trained in Six Sigma and Lean Management, as well as a few other methodologies, I have drawn many process flows describing the interaction between employee and customer or organization and customer, but never an organizational chart. I like it. Conceptually, it drives home a very good point--customer is king. As indicated by earlier comments, some people like to put employees on equal footing with customers. This is a nice thought, but at the end of the day, if your customers aren't happy, you are going to have a tough time taking care of your employees. Troy ... I would also add ... "if your employees aren't happy, then your business is going to have a hard time taking care of its customers." Starbucks recognizes competitors can replicate products, but they can’t replicate people. That’s why the company focuses so much attention on the Employee Experience because it is the employee that creates marketing magic with customers. Any business, any brand, and any service starts first with employees and second with customers. Sure, Peter Drucker says the purpose of a business is to create a customer. 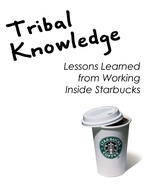 However, Starbucks Tribal Knowledge says the process to create a customer starts first with the business employee. The Starbucks Employee Experience revolves around the WIIFM – What In It For Me. Pronounced 'wif-um,' this employee-first mindset is rooted deep within the culture of Starbucks. It’s rooted so deep, employees at Starbucks are called Partners, not employees. Every new hire at Starbucks makes Partner from day one because everyone at Starbucks is a partner in delivering customer experiences. By realizing the Employee Experience Matters, Starbucks is rewarded with an employee turnover rate around 65%. Other quick service restaurants contend with employee turnover rates closer to 300%. To bring those numbers to life, the typical Starbucks will change over its staff once every 18 months compared to other fast food places which will turnover its staff 3 times in 12 months. Since Starbucks realizes the Employee Experience Matters, the company is rewarded by being viewed as an employer of choice through being recognized by Fortune magazine as one of the “Top 100 Companies to Work For” in America since 1998. 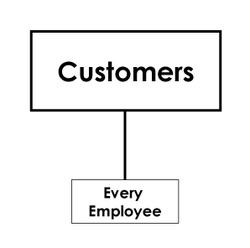 Another concept that comes to mind when I look at this image is that of moving all employees as close to the customer as possible. I work in a Technology organization. I work with application development teams, operational support teams, data warehouse teams, and so on. Many of the members of our applications and data warehouse teams spend a good deal of time interacting with the customers, but our operational support teams do not. Recently, I suggested we take one of our operational support managers to a customer meeting. Unfortunately, we experienced server outages the night before the meeting. The customer we were meeting with was negatively impacted and pretty sore about the outage. She lit into our operational manager. The experience gave him a greater appreciation of the impact of his team’s work on the customer. "... moving all employees as close to the customer as possible." BINGO ... Troy ... BINGO! As a business owner, it was apparent that a majority of employees view the connection between their paychecks and customers abstractly, if at all. OK, that I can agree with. "...employees at Starbucks are called Partners, not employees." What the org chart doesn't illustrate is where corporate lines up with employees. To the side? Inside the same box? Below? Above? Based on what you've outlined here it shows that Starbucks doesn't lose sight of the value of their employees, they EMPOWER their employees to serve the customer remarkably well. So, I would say that if the customer is king, then the employees are in the king's court and they have his ear. DUST!N (cool moniker by the way) ... in this org chart redux, corporate = employees and employees = corporate. To add some fodder fuel ... the King's Court isn't really the King's Court. It's the Customer's Court. Dig?